KOCHI: Buoyed by large shipments of chilli, spices export grew 35 per cent in quantity in the April- June quarter of 2017–18. Chilli became the most exported spice during the period with a shipment of 1,33,000 tonnes, fetching Rs 1,198 crore. “Chilli has been the most desirable Indian spice, thanks to international demand for quality spices in the global market. The board’s effort to promote garlic increased its’ export,” said Spices Board chairman A Jayathilak. Garlic registered the maximum growth in terms of quantity and value, rising 169 per cent and 107 per cent respectively. Fennel registered a growth of 92 per cent in quantity and 49 per cent in value through global shipment of 13,250 tonnes. The export of other spices such as mustard, aniseed and dill seed grew by 83 per cent in quantity and 63 per cent in value, compared to the same period last year.During the period, 1,220 tonnes of small cardamom, valued at Rs.134.55 crore, was exported as against 1,106 tonnes worth Rs.90.81 crore last year, registering an increase of 10 per cent in quantity and 48 per cent in value. Ginger, along with mint products, added to the overall spices export. The total export of spices rose to 3,06,990 tonnes in terms of quantity during April-June 2017 as compared to 2,27, 938 tonnes in the same period last year. Demand for processed and value-added spices resulted in an increase in the spices export basket. India continues to be the most prolific exporter of spices with a record 11 pc rise in volume and a substantial rise in value in 2016-17. 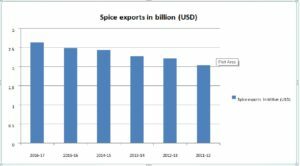 The Ministry of Commerce and Industry in India has recently divulged the figures of spice exports from India raking up to USD 2.63 billion (EUR 2.35 billion) in value. While chilli remained the most demanded spice, cumin followed the ranks in terms of international market demands. Meeting the stringent food safety regulations imposed by countries across the globe, Indian spices and spice products surged to a record export growth, both in terms of value and volume, sustaining the robust demand and stiff competition, a release from the ministry outlines. The rise in volume from 843,255 tonnes in 2015-16 to 947,790 tonnes in 2016-17 is more than 11 pc. The rise in the value of the spice exports from India is nine pc in terms of Indian Rupee and 6 pc in terms of US dollars. Chilli continued to be the most demanded spice in 2016-17 with exports of 400,250 tonnes amounting to INR 50.71 billion (EUR 70.33 million), registering an increase of 15 pc in volume and 27 pc in value. Cumin was the second largest exported spice from India, recording an increase of 22 pc in volume and 28 pc in value. A total volume of 119,000 tonnes of cumin valued at INR 19.63 billion (EUR 27.23 million) was exported from India in 2016-17. The increase was largely due to the mandatory checks on cumin and its by-products implemented by the Spices Board in the backdrop of rapid alerts from importing countries. Quite interestingly, the spice that showed the maximum increase as compared to the previous financial year was fennel, registering a 129 pc increase in volume and 79 pc in value. Increased global demand for turmeric, especially in the pharmaceutical sector, drove its exports to attain figures of 116,500 tonnes in volume and crossed INR 12.41 billion in value. Garlic exports contributed substantially to the overall growth during the year, notching figures of 92 pc in value terms and 39 pc in quantity. The export demand of nutmeg and mace was also on a higher side, registering an increase of 25 pc to 5,070 tonnes, as compared to 4,050 tonnes during 2015-16. The export of celery rose from 5,310 tonnes valued at INR 532.8 million in 2015-16 to 6,250 tonnes worth INR 624.6 million in 2016-17. 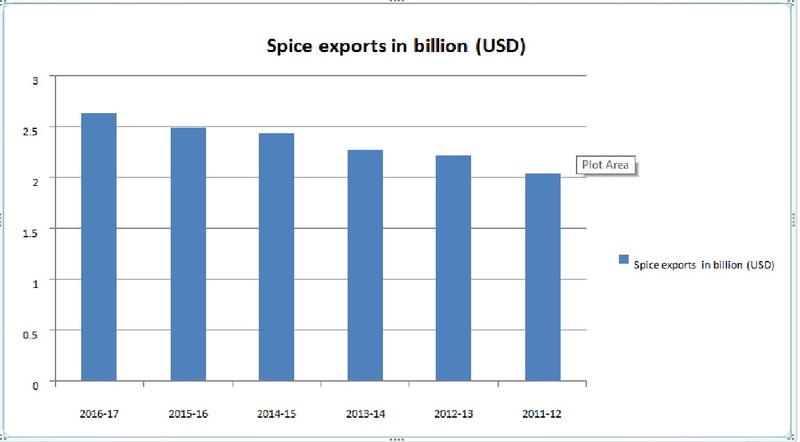 A shift in dietary preferences from conventional spices to processed and value-added spices was evident in the spice export statistics, which exhibited an increase in both volume and value as compared to 2015-16, contributing substantially to the spices export basket in 2016-17.In a statement to the press said that the efforts of Board is to promote the production of large cardamom, especially in the country’s north-eastern region that is the organic area by default, led to a rise in its exports by 30 pc in volume and nine pc in value. Current Indian garlic exports have risen threefold, compared to the same period last year. Indian exporters are having a field day selling the produce in the international market, as China experienced a crop failure, hence pushing up demand. “There’s monopoly for Indian garlic right now as China doesn’t have garlic. We are also receiving a lot of orders from Chinese importers who on the other hand export to Europe, currently our highest demand is actually from China,”. According to exporters, the prices have also doubled due to the increasing demand locally and internationally. Small scale exporters are exporting as much as 50 tons daily and from the look of things, exporter says, it will only get better as gulf countries such as Kuwait, Bahrain and Jordan have also developed a big appetite for Indian garlic. Other markets are Germany, Italy and Japan. Traders are optimistic that India has the capacity to meet the global garlic demand, as the crop this year is also good compared to last year. The export demand for Basmati rice, which was subdued for the last two years, is expected to witness a pickup in the coming months when a majority of the export orders are received. Subsequently, the Basmati rice industry is expected to witness a a rebound in H2 FY2017 and FY2018. This is expected to push up the realisations in H2 FY2017 and FY2018. Most of the large exporters, who are holding relatively lower priced inventory, are expected to benefit from this. While paddy prices have inched up in the current procurement season, this would be comfortably covered by growth in realisations. Jotwani said that the government’s recent demonetisation move has also resulted in a cash crunch in the system, thereby leading to deferment of paddy procurement by some millers/traders. Further, given that a large part of the rice industry is unorganised, many buyers may witness reduction in their buying capacity. However, this is expected to be a short-term impact and the steady demand would lead to restoration of buying in Q4 FY2017. In the past two years, the Basmati rice industry has been under financial stress on account of excess paddy supply and weak international demand, leading to a sharp decline in realisations. The average export realisations declined from Rs 77,988/MT in FY2014 to Rs 56,149/MT in FY2016. However, there has been some improvement in demand in Q1 FY2017 also reflected by the increase in export realisations to Rs 59,247/MT. For the remaining period, the export demand is expected to improve further, with Iran also expected to join the order booking. Further, steady domestic demand growth would add to the overall improvement in realisations for the industry.